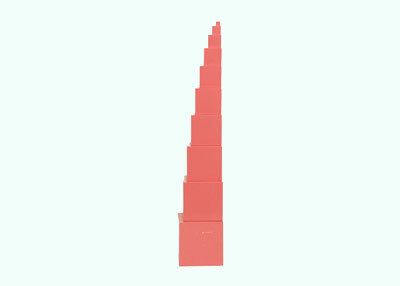 Ten pink wooden cubes varying in size from 1 cubic centimetre to 1 cubic decimetre. cubes respresent the cubes of the numbers 1 -10. It is preparation for cube root. 8 of the smallest cube make the second cube 2 x 2 x 2. 27 of the smallest cube make the third cube 3 x 3 x 3. 64 of the smallest cube make the fourth cube 4 x 4 x 4.
cube 10 x 10 x 10.